Eighteen years after completing her first ever mural at Newtown School, Ellen Coup is back completing another. 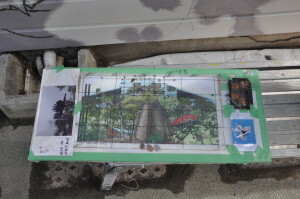 This time on a 3.5 x 6.5 meter wall of a building that juts out into the playground. I’d read in a press article from about ten years ago that she found murals big and scary, I asked if this was still the case. No, she says “they are still challenging, but after forty or so projects, I’m not scared any more”. 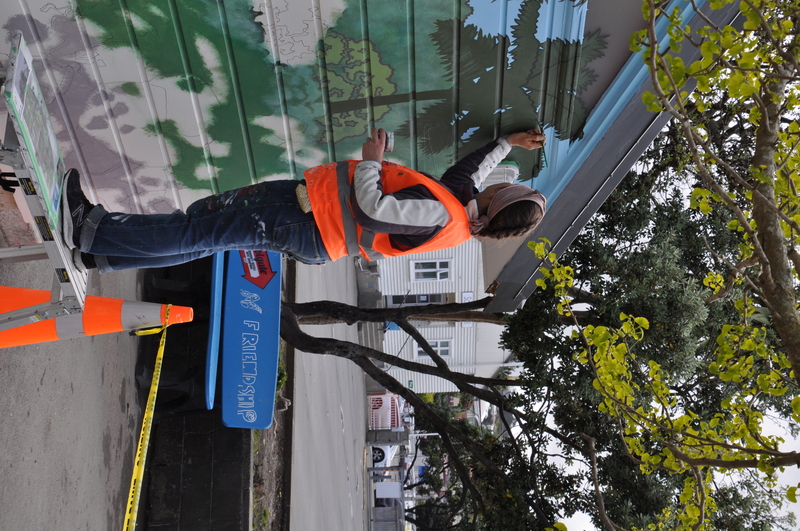 For the first mural she tried to get input from every student, at what might be Wellington’s most multi-national primary. This time she designed the work, though modified it to incorporate requests from The Friends of Newtown School who commissioned her. I arrived with coffee when we met, luckily it was during the school holidays. During term time it’s a lot noisier and there are plenty of questions from curious kids. Radio NZ National comes through her earbuds and acts as a structural clock – it must be early afternoon – Jesse Mulligan is on. She’s one of those artists who always painted and drew and she was always encouraged to do so. She was born in Christchurch but moved at the age of seven, first to Ashurst and then to the capital. After attending Wellington High School in the late 80’s, she implies there was a bit of a mis-spent youth before attending Whitireia Art School and then launching into her current career. She doesn’t get to work on her own paintings as much as she’d like – or as much as some collectors would like either. Most of these works are Wellington based and they don’t compromise on the prevailing weather conditions. There’s one I know that focusses on Phil Price’s Zephyrometer out near the airport on a day when it was just about bent double. Then there are a series of coastal scenes when the weather is fine, the water is clear and the golden rocks are just as they are – Ellen describes her work as “contemporary realism”; I think that’s apt. Rod McCleod, was a high school art teacher and she speaks highly of the teaching of Sheyne Tuffery (who has already been interviewed for this series) who taught her at a painting workshop at Whitireia. When I emailed Ellen with supplementary questions I received a long list of tutors who she feels had a positive influence – Peter Deckers was at the top of that list. I ask about New Zealand artists that she admires, she lists Rita Angus, Robin White, Nigel Brown and Marianne Muggeridge. Ellen was life modelling at Massey University when she met Marianne. Internationally amongst others, Diego Rivera, Frieda Kahlo and Van Gogh. Whitireia when she was there provided an all-encompassing education that covered many different strands of art and crafts. She says that they didn’t really teach painting in the conventional sense but did teach her to draw. There was a city-based series a few years back where Ellen attempted to get viewers to look in more than one direction through reflections on the windows of buildings and buses. A possible precedent for one of her recent murals which is also one of her favourites, it follows the iconic Wellington cable car out of the first tunnel up from the city. Another one mentioned, though a little older, is the Rata wall inside the visitor building at Zealandia. Commissions involve a large element of facilitation, interpreting or translating the ideas of the commissioners to something that works on the space provided. Ellen jokes that when asked for a pink elephant, she no longer says “are you sure?”. She now says “do you see it sitting or standing?”. 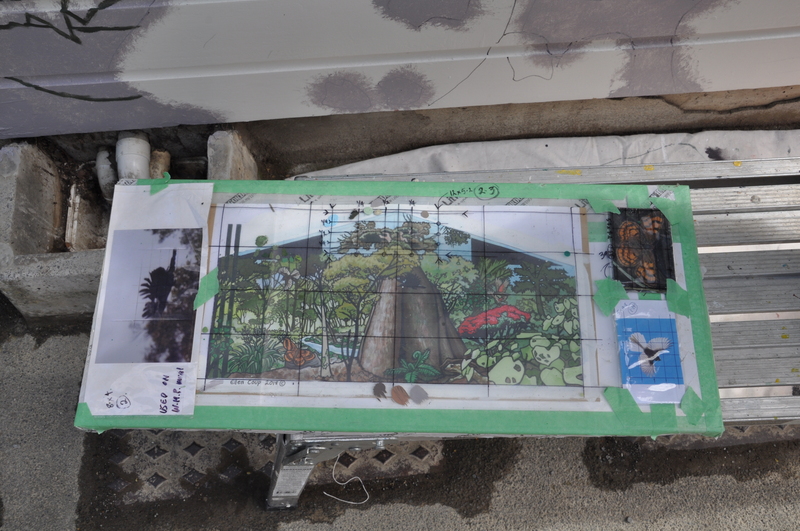 On this commission, she’s working from a completed, hand-coloured drawing, scaled and gridded-up and wrapped in plastic to deal with the elements. Her Toyota Corolla wagon is backed up to the wall and operates as both workbench and a respite from the wind. She always uses Resene products, she likes the quality and the range and the fact it is a New Zealand company. On others jobs she uses an art application similar to Photoshop to work through the initial options, though she says the program sometimes over-complicates the image, adding layers that needn’t be there. It has been tough going over the years, working as a “brush for hire” or in the words of her friend Bodhi Vincent, an “art labourer”. 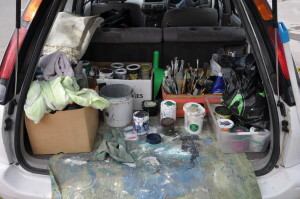 I ask whether her twenty-year-old son has followed his mother into art. She says he’s more pragmatic and has a desire to travel. 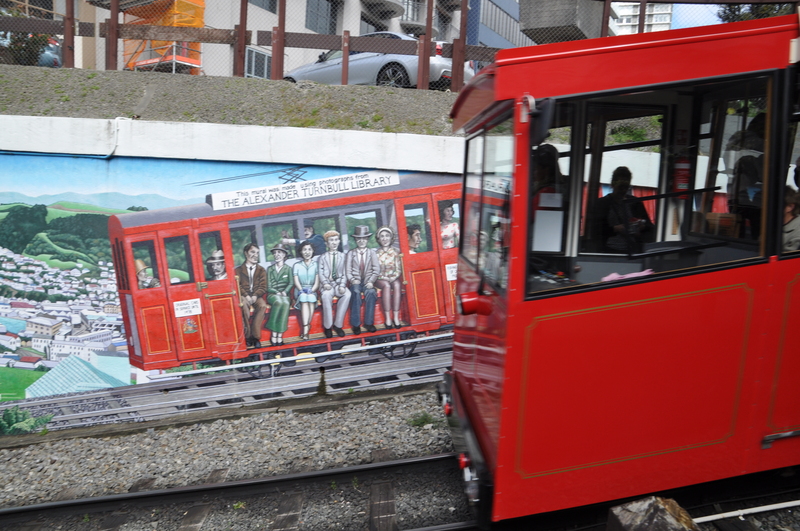 Clearly not a current option for the Kapiti based artist, one of Wellington’s hardest working muralists. On your walks or drives around Wellington, you try and spot them. If you’re right, in the bottom right corner there’ll be be an Ellen Coup signature and copyright. For you it’s free art! Enjoy. The Art Library has a small selection of Ellen’s work available for rental and sale.